In this post, we’re continuing with the Self Forgiveness and Commitment Statements, where we’re in the process of identifying, disentangling the Wolves Sheep Clothing – strand by strand, in showing/revealing the illusion, the evil within and behind love/good/light/positivity within the context of how it is currently being lived by/through the Mind as ENERGY, hiding/veiling the real, true nature of our beingness – instead of Love being/becoming an actual living commitment, visible, in and as this Physical Existence for self and for all in/as equality and oneness here. I forgive myself that I haven’t accepted and allowed myself to see, realise and understand the evident separation existent in the statement “All you have to do is be present with where you are in this moment” and then following to “and your heart will awaken your soul to surround you with an Eternal Love greater than life itself”, because within the context of ‘being present with where you are’, this statement obviously imply that this ‘present’, that this WHERE self is: is Not in the Physical. Because, if one was really in fact ‘present’, ‘here’ in the Physical, with the physical body in actual reality in equality and oneness: self would be with one’s physical beating heart, one’s entire human physical body, and in this even be able to in/as this equality and oneness, communicate with one’s own Physical Body. But, even such communication, such direct equal and one communication do not exist because this ‘Consciousness’ of energy, of knowledge and information, this ‘energy creation machine’ has been regarded to be MORE than the Physical Body, and so this Physical Existence, as is even illustrated within the external representation of the Mind/Consciousness and Energy as the World System of Money – technological evolution, the ‘money creation machine’ regarded MORE than this Physical Existence, and as with the external consequences to the physical existence, human, animal, nature and earth lives/beingness, so exist the internal consequence of the sacrifice of the physical body as Consciousness mine the physical for energy as the World System mine this Physical Existence for Money. In this, I forgive myself that I haven’t accepted and allowed myself to within this consider – how we in any way could have made this Consciousness, our ‘energy experiences’ to be MORE than the Physical Body, this Physical Existence that is in fact producing the REAL life for/as us as Breath and the unified/holistic equal and one physical existence producing the resources for/as each Breath to exist, each beating of the heart to exist. That, we haven’t within this even considered, or do not even for a fraction of a moment consider – how ALL of existence in the physical is totally disregarded, ignored and not even recognized with the extent of the processes that in fact manifest to make the Breaths, the beating of the hearts/life forces of humans, animals, nature and the earth possible, as we’re so possessed within and as the Consciousness in ABSOLUTE separation from/of what is HERE as the current physical production/context of life in and as this existence. So, in this, I forgive myself that I haven’t accepted and allowed myself to see, realise and understand that it must be considered then – with so many of existence, all of existence – from a Physical Body perspective, and this Physical Existence perspective making Physical ‘life’ possible on a physical level: where essentially from a PHYSICAL perspective, everything is being taken care of and cared for by countless beings/manifestations/organisms/microorganisms from the Great to the Small: WHERE or WHO is the problem with HOW we’re living in and as the Physical that is producing the very breaths, the very heart beats of Physical life? Why have we not considered this existential equality and oneness, this ‘physical interconnectedness’ of everything/everyone that is producing/providing LIFE on earth? WHY is it that we as human beings are not LIVING / EXPRESSING with and as ALL that is Physical that is producing physical life for/as all of existence? Obviously, here – can be seen the problem, the root of the Evil as the HUMAN. Because, what we’re doing here is the REVERSE, instead of us having harnessed / developed this relationship with the Physical and all the beings/manifestations/parts within it all that produce physical life, and have us as human beings live with and as it in producing an equilibrium in our relationship to the physical and each other and actually co-existing: we’ve separated ourselves from ourselves, our own physicals and so this physical existence as a whole into a CONSCIOUSNESS and so are not really in fact HERE with and as everything, and in this Consciousness – because of the separation, we have ‘made our own version of life as EXPERIENCE in and as ENERGY’ in and as our own Minds in complete separation to the Physical Life produced within and as this actual, real, physical Reality. In this, I forgive myself that I haven’t accepted and allowed myself to see, realise and understand how and why we would thus strive for an Afterlife experience of eternal love, as the same figurative, metaphorical, abstract eternal love we create as an Energy-Experience in the Mind – because in and as the Mind/Consciousness, we are essentially already ‘dead’ – remnants of the living, the physical, that we sacrifice to create Ghosts in the Mind as the thoughts, feelings, emotions, internal conversations etc. – that either haunt one or please one, dependent on the process used to generate/create the energy from and of the physical – either through trauma / or for pleasure as eliciting either a positive energy experience or negative energy experience resourced from the Physical. And so, we in and as the Mind as Consciousness live from the past as the present when/as our awareness in the Conscious Mind is greeted from the ghosts of the physical and in/as the ‘present’ we then in our conscious awareness create in the quantum reality of energy – whatever it is we want, such as an eternal love energy-experience. In this quantum heaven/hell energy reality of the Mind/Consciousness – completely separate from the Physical, from the HERE – living out our lives as the ‘living dead’ – waiting for the Afterlife that match our already-existent ‘after-Life’ / ‘past-Life’ as the Mind; as this actual, real physical existence where we can/are more than able / capable to make a difference in, with living/existing as the actual, real beating heart, living breath that is produced by/through the physical ‘life’ of the physical body and this physical existence as a whole, which we’d disregard for a metaphorical/figurative abstract experience/reality in/as the MIND/CONSCIOUSNESS. I forgive myself that I haven’t accepted and allowed myself to see, realise and understand the evil existent within the statement “All you have to do is be present with where you are in this moment” and then following to “and your heart will awaken your soul to surround you with an Eternal Love greater than life itself” – that we’d even gone to the extreme of separating ourselves from and of physical space time, equal and one, physical body and physical existential movement/expression – creating an alternate past/present/future relationship in the quantum energy reality of the Mind/Consciousness, where in our Minds we create our own ‘time’ and so our own version of ‘life’ – when the HERE of and as this Physical Existence goes unnoticed, uncared for, and essentially discarded, because we’re possessed, the ‘living dead’ in and as our Minds as Energy – that we’re not seeing, realising and understanding or even wondering about/considering: why/how it is that when we leave this PHYSICAL existence – the PHYSICAL continues HERE, and we ourselves become completely forgotten, no longer forming part of Physicality AT ALL. I mean, are you really sure, really certain – that ‘Death’ is the key to ‘life’ / ‘eternal love’, when the very processes of what one do in the Mind, in the quantum-energy reality of Consciousness – is slowly, but surely, draining the life out of your Physical Body, creating already your heaven/hell in and as the Mind filled with the ghosts, angels, demons of the positive/negative/neutral thoughts, emotions, feelings etc. – what if, what has never been considered, is that at birth, in and as the Physical, we are actually given an opportunity for LIFE in equality and oneness with and as this Physical Existence, but the sins of the fathers, the evil, the reverse of Life, had been created with everyone creating an after-life, a past-life in the Mind, in the sense of AFTER-life / PAST-life – that we take life as the physical, consume it and create it into energy as the Mind; and so all we’re doing and have done is diminishing life for an Illusion of life in the heavens/hells of the Mind as Energy. And so, I would really suggest to consider that – we have this One Life, this One Opportunity still, to establish REAL, PHYSICAL LIFE ON EARTH within and as equality and oneness with the Physical, instead of what we’ve become, the Dead, leaving to the Dead – from the Mind into the ‘hereafter’, constantly moving from a past into a past – as an after-life we create in our Minds, and then a here-after, as the past of our lives on earth we move into when/as we leave the here of/as this Physical Existence. 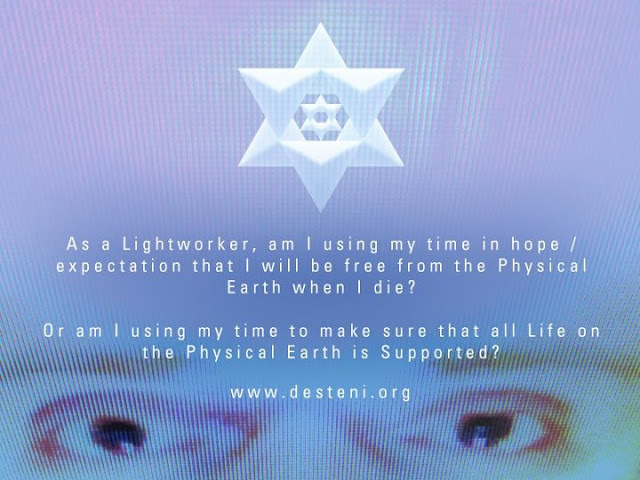 Investigate Desteni, Equal Money – establishing HEAVEN on EARTH as LIFE HERE.